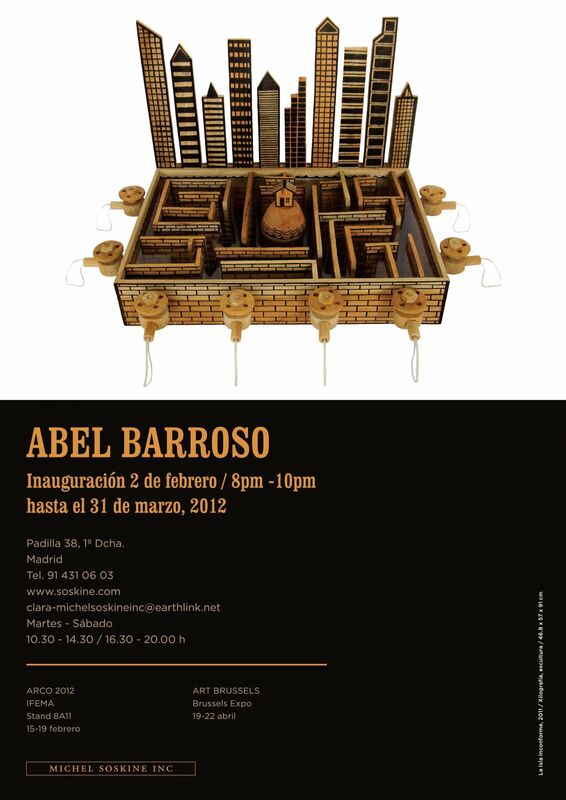 Michel Soskine presents in his gallery in Madrid and in ARCOmadrid, the first solo show in Spain of the Cuban artist Abel Barroso (Pinar del Río, 1971). The exhibition includes an installation, 11 "sculptures - objects" of wood and a dozen ink drawings and collages. In his "objects - architectures" Barroso who lives in Havana, offers works in which he prints in wood the signs that illustrate the confrontation of man with the invasion of technology, the virtual or real borders of globalization and also the walls of an emigration that has been denied of a dreamed global consumption. Barroso is part of a generation of artists who renovated aesthetically Cuban printmaking in the early 90's, transforming the traditional woodcut technique into three-dimensional objects. "If on one hand engraving is considered a conservative genre, since I started to build I decided to do something different with the technique, use its language, develop it in the way that interested me, finding new variations... I wanted to revolutionize the base, for example, make three-dimensional prints." With this manual technique, (the artists uses a specific wood from trees of his home town), he contradicts the actual meaning of the objects created: telephones, computers, cameras- soulless industrial products. The exhibited works conceptualize the human traffic to the borders of a developed world. The crafted images offer at the same time, the contradiction between tropical technology (humorous reference to the Caribbean fruit) and the coldness and the absurdity of global manufacturing. Works like Visa Monopoly, Wheel of Fortune or Build your own Travel Kit, seem at first sight like toys for children, funny and innocent, but they are in fact games for adults. Barroso uses clever titles and images of global signaling like A Passport, A Visa, The Embassy and A Surveillance Camera, etc ... He reuses the symbols of our Orwellian world to create his own language. His objects require audience participation and like professor Michèle Dalmace explains (specialized in Hispanic Caribbean art) "they refer to the imbalance between some games practiced abroad, deprived of sociability, and the socialized Cuban games." Barroso’s searches for a social involvement giving the work a human dimension, but ironically he divides society between mazes, fractured spaces, bridges and walls. Borders that act as reminders of the differences between real and mental cities (El Dorado). The Nonconformist Island, 2011 is trapped between the walls of a labyrinth and controlled by a city of skyscrapers. The apparently cosmopolitan city is instead an exclusive and closed agent. The continuous overflow of water (globalization) causes the disappearance of the small island (independent identities). Since the Cuban Revolution, the arts have been supported by the institutional system. The first Biennial of Havana in 1984 signaled the opening in Cuba of a decolonized art, ephemeral, outside the channels of distribution and of international trade commitments. The generation of artists from the 90's, to whom Barroso belongs to, went beyond by breaking genders. Barroso moreover uses a sharp sense of humor. Barroso studied at El Instituto Superior de Arte in Havana in 1995, and has exhibited in several galleries in Cuba and abroad. Public collections include amongst others MoMA, the Bacardi Foundation, Wilfredo Lam Centre (Cuba) and The Blanton Museum of Art, University of Austin, Texas. In May, the National Museum of Fine Arts in Havana will be presenting his first solo show during the city’s Biennale.